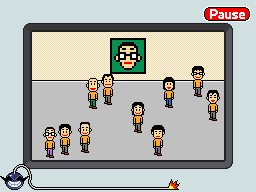 Info "We're looking for someone..."
Face Finder is one of Orbulon's microgames in WarioWare: D.I.Y. The point of the game is to locate the person that is shown on the screen. The player needs to tap the person that is shown on the screen. The person may either be a bald man, a woman, or a man with glasses. However, many other people are also found around the microgame, giving the player some difficulties. If the player taps the correct person before time runs out, the game is won. However, if time runs out, the game ends in a loss. If the player taps the incorrect person, the incorrect sound effect plays and the player needs to continue the search; this does not penalize the player. This page was last edited on July 18, 2018, at 09:26.